Trending at $24.29eBay determines this price through a machine learned model of the product's sale prices within the last 90 days. 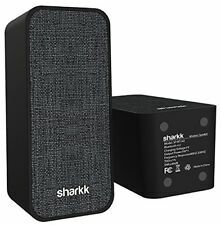 NEW Sharkk Twins Bluetooth Speaker Set - Portable Stereo Sound . Condition is New. Shipped with USPS Priority Mail. Sharkk Graham 20W Bluetooth Speaker with Bluetooth 4.2 Technology Portable Wir..
Sharkk Graham 20W Bluetooth Speaker with Bluetooth 4.2 Technology Portable Wireless Speaker with Built In Mic and 2500mAh Battery. Let the Sharkk Graham Portable Bluetooth Speaker be your background source for great sound. PREMIUM DESIGN - The 5W Denim Wireless Speaker features triangular design with an attractive denim outer surface. USER FRIENDLY CONNECTIVITY - The AUX port on the portable speaker lets you enjoy audio through your external devices 500 mAh BATTERY - With a 500mAh battery, you can spend the whole morning listening to your favorite music. The Curve Speaker. Uses Bluetooth 4.0 Technology and Features a Range < 30". Bluetooth Version: 4.0. Produces High-Quality Audio Within a Compact, Stylish, Portable Design. Range: 30′. The Sharkk Commando Plus Rugged Bluetooth Speaker features multiple EQ settings allowing you to optimize the sound quality for the ideal indoor/outdoor/surround-sound experience. EQ settings for ideal indoor and outdoor sound. NIB Sharkk The Lodge 12W Bluetooth 4.2 Portable Speaker FREE GIFT WITH PURCHASE! Change the way your music sounds and looks with the Sharkk Lodge 12W Denim Speaker. The long triangular design and denim surface give the speaker instant appeal while the strap adds convenience and versatility. IP65 WATERPROOF SPEAKER - This rugged, solidly constructed wireless speaker features a rubberized coating, making it dustproof. Use the built-in microphone to receive phone calls. Dig your speakers into the sand and create the perfect vibe for your beach gathering. Waterproof Bluetooth Speaker Sharkk 2O IP67 Bluetooth Speaker Outdoor Pool Beach and Shower Portable Wireless Speaker. Let the Sharkk Graham 20W Denim Speaker be your background source for great sound. A catchy, modern design and textured surface will only add to the atmosphere and décor. Place the speaker just about anywhere---the anti-skid pads keep the unit stationary while it fills the room with crisp, clear sound. Sharkk Lodge Bluetooth Speaker with Bluetooth 4.2 Technology Portable Wireless..
Sharkk Lodge Bluetooth Speaker with Bluetooth 4.2 Technology Portable Wireless Speaker with Built In Mic. Denim Stylish Speaker. Change the way your music sounds and looks with the Sharkk Lodge 12W Wireless Bluetooth Speaker. 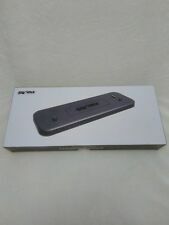 Sharkk Graham 20W Bluetooth 4.2 Speaker New In Box MRSP $59.99. Condition is New. Shipped with USPS Priority Mail. SOUNDS GREAT !!!!!! 1-CHARGING DOCK. Our goal is to keep you satisfied and resolve any issues you may have. Do NOT open or reassembly the item, because we will not accept the item back. We will inspect the item when we receive the item. Bluetooth spec: Bluetooth 4.2. Anti-slip pads keep the unit stationary while on flat surfaces. Sensitivity: 80db±2db. Frequency Response: 90Hz-20KHz. Sharkk bluetooth speaker. Condition is Used. I used this speaker only a few times. Works great! Sound is amazing! Has great bass! Perfect size for on the go listening. All accessories included. Shipped with USPS Priority Mail. LONGEST BLUETOOTH RANGE ON THE MARKET The Sharkk O Bluetooth Speaker has a Bluetooth range of up to 60 feet for uninterrupted music streaming and 100 feet of connectivity. The connectivity range makes it the ultimate portable speaker. Open Box, New conditions, 100% Working. Let the Sharkk Graham 20W Denim Speaker be your background source for great sound. A catchy, modern design and textured surface will only add to the atmosphere and décor. Place the speaker just about anywhere---the anti skid pads keep the unit stationary while it fills the room with crisp, clear sound. Watson Bluetooth Speaker Denim Wireless Portable With 4.2 and in. Condition is New. Shipped with USPS Parcel Select Ground. NIB Sharkk Graham 20W Bluetooth 4.2 Portable Speaker FREE GIFT WITH PURCHASE!! SHARKK Wave Speaker Charging Dock Compatible with Wave Speaker allows Continuous Play Easy Connectivity. With the speaker on the. SOLID DESIGN - The wave speaker dock is solidly designed and sits firm while the speaker is charging. SHARKK Mini Bluetooth Portable Speaker (W915). Sharkk Bluetooth Speakers Mini Ultra Portable Alloy Steel Rubberized Housing Powerful Sound and Bass Built in Micro SD Card reader and Mic. Built in Mic. Barely used, no damage! Sounds great! With the SHARKK ²O Bluetooth Speaker, you choose what you want to play – anywhere you want. Its rugged rubber construction houses dual 4W or 10W each loudspeakers for dynamic sound. (total8W or 20W). Sharkk Lodge Bluetooth Speaker with Bluetooth 4.2 Technology Portable Wireless Speaker with Built in. Change the way your music sounds and looks with the Sharkk Lodge 12W Denim Speaker. The long triangular design and denim surface give the speaker instant appeal while the strap adds convenience and versatility. You can add more style to your style with Sharkk’s Watson 5W Denim Speaker. Sharkk Watson Bluetooth Speaker Denim Wireless Portable Speaker with The Lates..
You can add more style to your style with Sharkk's Watson 5W Denim Speaker. Sit back, relax and enjoy the morning with your favorite music playing in the background. Cool Design The Watson's triangular shape and denim texture give it an eye-popping look and all around visual appeal. Leonardo da Vinci once said "water is the driving force of all nature". One has to imagine that da Vinci most certainly would have conceived of a way to free us from our crippling fear of cloudy skies, spilling beverages and the one guy at every pool party who just has to demonstrate his belly-flop technique. ● LONGEST BLUETOOTH RANGE ON THE MARKET The Sharkk O Bluetooth Speaker has a Bluetooth range of up to 60 feet for uninterrupted music streaming and 100 feet of connectivity. The connectivity range makes it the ultimate portable speaker. ● HIGHEST WATERPROOF RATING IP67 This Bluetooth speaker is solidly constructed and features a rubberized coating that makes it shockproof and dustproof. The IP67 rating means that this speaker is FULLY WATERPROOF as well so you can use it in the shower or take it to the pool or beach without having to worry about water damage. ● MULTIPLE CONNECTIVITY OPTIONS The Sharkk O waterproof speaker can be connected to your device using the auxiliary port or by using Bluetooth connection. When you dont want to bring your phone with you the speaker also features a M.